Have you ever heard the term “Achilles heel”? An Achilles heel is a weakness in spite of overall strength, which can actually or potentially lead to downfall. I am not really the bragging type but I’d like to consider myself as a ‘power consumer’ with an above-average level of savviness when it comes to getting a good deal. I’ve been using eBay as both a buyer and a seller for almost 20 years now (so pretty much since they started operations) and trust me when I say that this platform, while offering incredible opportunities to score truly amazing bargains (and maybe exactly because of that! ), can catch even the most experienced hands off-guard. While eBay has no doubt been great for the millions of buyers who were able to score bargain prices, it has become a very tough environment in recent years for the small ‘mum and pop’ sellers. Given that most sellers on eBay operate at wafer thin profit margins, the only way to make a serious living from eBay is to sell at very large volumes. This is not feasible for small operators and especially those who sell unique (often hand-made) items. Furthermore, eBay has increased substantially their platform fees and have also made it effectively mandatory to accept payments through PayPal (which they owned until very recently) who take their own cut in addition to the fees eBay charges. As a result, more and more small sellers are being squeezed out of the eBay marketplace and instead choose to sell their products either through their own websites or niche marketplaces built specifically for small sellers like Etsy (who have become quite a large ‘beast’ themselves). So just so you know: when you shop on eBay, you are most likely not supporting a small business owner but rather a big business and it clearly seems that eBay is happy with this trend and want it to continue going forward. On the flip side, you can still score some incredible bargains on eBay if you know how and that’s what I hope to help you achieve by reading this. eBay were also the first to introduce to the world the concept of a mass online auction. Like any other auction, the idea is to generate excitement by auction participants and emotional attachment to the item being auctioned. Also like with any other auction, those who have strong nerves and have done their homework on the item being auctioned as well as the way the system operates, can and do ‘clean up’. Those who don’t, often get fleeced and end up paying too much. Trust me on that last point as I am talking from personal experience here. It has taken me years to perfect my eBay strategies and they also have to be constantly revised as the platform evolves and changes. My aim with this post is to provide you with a ‘shortcut’ in the form of tried and tested eBay strategies that have proven themselves to work for me (as well as many others). I will show you how to find and secure the best deals on eBay whether through auctions or through fixed-price listings (also known as ‘buy it now’ or BIN for short). This can include new, refurbished and used items you can buy and pay for straight away. There is no bidding and no waiting for the auction to finish. This means that you should evaluate the items for sale in exactly the same manner as you would evaluate any other item sold online anywhere else. This means that the two main things you need to consider are the item’s sale price (including any shipping costs if applicable) and the seller’s reputation score (even though that is less important due to the extensive buyer protection mechanisms employed by both eBay and PayPal. Given a ‘buy it now’ item is your stock-standard online sale, you should start by checking how much this item is being sold for outside eBay. Tech Bargains (as the name suggests, this is for tech stuff. Kinda like the global equivalent of Static ice. Once you know the going price elsewhere for the item you’re after (make sure to also account for any shipping charges! ), it is time to see what eBay has to offer in the fixed price category. This might sound easy and self-explanatory but there are a few things you need to do to maximise your search efforts and chances of getting the absolute best deal on offer once you get the initial search results page. They are not available for immediate purchase. You have to wait until the auction ends and this could be up to 10 days from now. The price shown in the search results is the current bid price and this can obviously go up at any time and especially as the auction approaches its end. So filter out the auctions from the search results. Despite what the name might suggest, this is not actually the fixed price sales that best match what you were searching (like you’d expect in a Google search). Instead, this is generated using a very complex algorithm used by eBay in which they take into account (amongst heaps of other stuff) the amount of available items on sale in each listing, the seller’s reputation and sales history on eBay and whether or not they have a dedicated eBay store. Bottom line, you don’t need it and it can actually confuse the hell out of you. You’re probably already aware that eBay is a global business operating multiple country-based sites. What you might not be aware of though is that eBay has one single global catalogue which is accessible through any of its individual country-based sites. The thing is that by default, eBay will not show you any items whose price is denominated in anything but Australian Dollars (even if their seller is more than happy to sell and ship to people in oz). 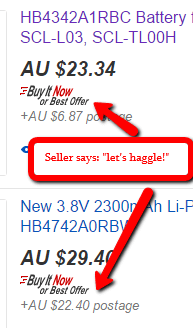 I never quite understood why eBay does that even if the seller nominated the sale price in a currency other than the user’s home currency (Aussie dollars in our case), eBay will still show an indicative price in the user’s home currency regardless. When you do a global search, eBay will show you their entire global catalogue of search results for the item you’re after, regardless of the currency a listing is denominated in. 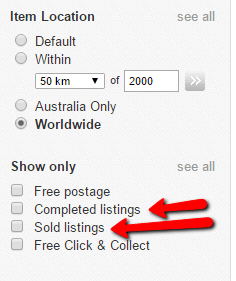 If the seller has listed Australia as one of the countries they’ll ship to, their listing will show up in the ‘worldwide’ search results on the Australian site. 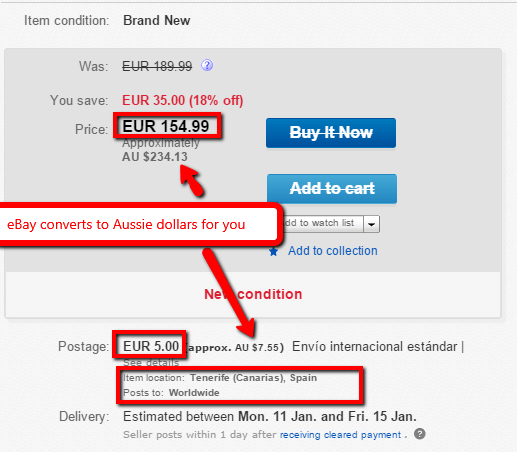 As you can see, eBay converts the foreign currency price to give you an indicative price in Aussie dollars but keep in mind that you’ll still be charged in the original foreign currency (Euros in this particular example) if you buy this item. This means that unless you have the right debit card or credit card, your bank will slug you with a currency conversion fee on top of the purchase price which is usually 2.5%-3.5% of the purchase price. Alternatively, you can opt to allow PayPal to apply their exchange rate and convert the foreign currency amount to Aussie dollars for you. However, that will not be a wise decision since PayPal’s currency conversion rates are terrible and you’ll actually be better off letting your bank convert using the interbank wholesale exchange rate and cop the currency conversion fee on top of that if need be. eBay will automatically apply 10% GST on the total purchase price in order to comply with changes to Australia’s taxation laws which came into effect on July 1, 2018. For you this means you’ll end up paying 10% extra above the price you see in the particular listing. Protections available to you under Australian Consumer Law may not apply to sellers located overseas. However, you are still protected under eBay’s buyer protection measures as well as any PayPal protections if you used that service to pay for your eBay purchase. People make mistakes. We all know that. On eBay however, these mistakes can mean the difference between scoring a good deal and scoring an absolute bargain! The premise is that if sellers misspelled their item name or description, eBay’s search engine will not pick it up, it won’t show in people’s search results and the poor seller will get no sales. While this strategy is a lot more powerful in auctions where buyers essentially compete against each other, it is also worth trying out for fixed price items, especially given some sellers include a ‘buy now’ option in their auction listings. The reason why they do that is to entice the buyers who don’t want to muck around with bidding at auction (either because they don’t have the skill, patience, time or all of the above). With this option, buyers have the option, provided no bids for the item have been made yet, to pay upfront the ‘buy it now’ price stipulated by the seller and get the item straight away without having to wait for the auction to end. While you can try and think of different ways to misspell the item you’re after and then run individual searches for those variations, this might take awhile and you might also miss some potential misspelling options. There is a completely free services that will run all the common misspellings for the item you’re after (based on eBay’s actual search history) and give you the results in a nice list with links to all the individual misspelled items. Many people think that the price for fixed price items is set in stone and is non-negotiable. This is not true! Many sellers of fixed price (a.k.a ‘buy it now’) items offer an option to haggle through the ‘best offer’ mechanism. How to find sellers willing to haggle? 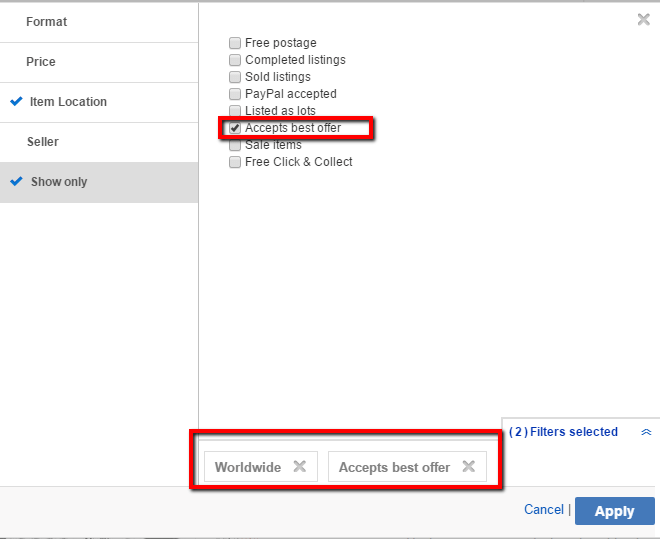 This is a little hidden gem that not many people use or are even aware of but eBay allows you to easily find items for which sellers have enabled the ‘best offer’ option. First you go to the refinements sidebar of the initial search results and click on ‘More Refinements’. Find the cheapest price your item is currently fetching at auctions with less than 24 hours remaining (I’ll show you how to do it a little later below). It is often said that eBay auctions is what separates the eBay amateurs from the ‘bargain hunting ninjas’ and I tend to agree. While you can score some really incredible bargains in the fixed price sales (especially if you follow the strategies discussed above), you can get some truly insane bargains through auctions (and I’m speaking from personal experience here! 😉 ). The great thing about eBay’s Australian site (unlike its north American counterparts) is the fact that auctions on eBay Australia don’t have a reserve price. On eBay’s American site for example, you can list your item for sale in an eBay auction for the starting price of $0.99 but with a reserve price of say $50. If you receive bids on your auction but those bids don’t push the price up beyond your pre-determined reserve price, you are not bound by the auction’s results and don’t have to sell the listed item to the highest bidder. You can’t do the same thing on eBay Australia! If you list your item for sale in an auction and you get just a single bid, you must sell the item to the person who was the highest bidder, even if they were the only bidder. As a seller, there are no ‘out clauses’ for you. The only way an auction on eBay Australia can end without the item being auctioned changing hands from the seller to the highest bidder is if the buyer fails to make a payment or asks to cancel the transaction (a request that the seller doesn’t have to accept). While the auction is a bit more complex and takes more time to complete compared to the straightforward fixed-price ‘buy it now’ sale, it gives the buyer almost complete and total control and if that buyer is well-versed in how eBay works in general and eBay auctions in particular, they can really ‘clean up’! If you have the time and patience to wait it out, it is well worth your while to give eBay auctions a try. The steps below will help you make sure you get the absolute best deal. Before we get going though I just want you to keep in mind that according to eBay’s rules, bidding at an auction is not a way to indicate an interest in the auctioned item but rather indicates a binding commitment to purchase if your bid ends up being the winning bid. If you win but get cold feet or ‘buyer’s remorse’ you can request the seller to cancel the transaction but keep in mind that they don’t have to agree to it (and if you’re the only bidder they will almost certainly refuse). If the seller refuses to ‘cut you loose’, you are bound to complete the transaction and pay for the item you won. If you don’t, eBay will register a ‘strike’ against your account. Get too many strikes and you’re out (i.e banned from the platform). If you think that you can then just open another account with a different email address, think again! eBay have ‘been around the block’ for some time now. They’ve seen and experienced all the tricks you can think of (and many that you can’t) and have implemented very sophisticated (and expensive!) mechanisms to make sure everyone plays nice on their platform. One of the greatest things on eBay for buyers (and maybe not so much for the sellers) is that eBay never forgets anything. Every single auction anyone has ever run on the platform is categorised and available to be searched and retrieved. Completed listings – That’s all the auctions that have been listed on eBay for your item recently. This includes both auctions that ended without any bids and auctions in which the listed items were sold. This is very useful to gauge the level of interest past auctions of the item you’re after have generated based on their starting price, time of listing and the detailed item descriptions. Sold listings – As the name suggests, this lists all recent auctions for the item you’re after that ended up with a sale. This is very useful to get an idea of what your item is expected to actually sell for at an eBay auction. Regardless of if you plan to buy at auction or through a fixed price listing, you can’t enter the eBay ‘arena’ until you know what you’re up against. Therefore, it is absolutely crucial that you know exactly what is the current ‘going rate’ for the item you’re after both within eBay’s fixed price platform as well as elsewhere outside eBay. The steps and tools I’ve covered above when I talked about finding the best prices on fixed price listings should take care of that. Given auctions start and end all the time on eBay, it is not feasible to just look for an auction with the cheapest price. Many auctions start with a very low starting price in order to entice bids but prices often rise very quickly as the auction approaches its end. It is a well known fact to every eBay ‘veteran’ that the vast majority of bids come in the last few hours (or even the last few minutes or seconds) of an auction. 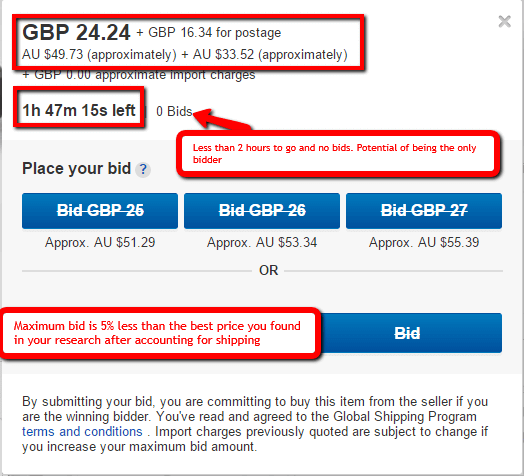 As a matter of fact, one of the most common mistakes beginners make on eBay is to bid too early so please don’t do this! Instead, you should only pay attention to auctions which end within the next 24 hours. If the item you’re after has lots of auctions, I would even further reduce this timeframe to 12 or even just 6 hours. Now take a look at your results and identify all the auctions within your chosen timeframe that have a current bid price which, after accounting for shipping charges, still give a lower price overall than the cheapest price you can find in ‘buy it now’ listings or outside eBay. Do not bid on any listings that have more than an hour left to go. If there is less than an hour left to go and the current bid is more than 10% lower than the best fixed price you could find, you could enter a bid with the maximum bid amount being 10% less than the cheapest fixed-price you were able to find. Just so you know, 10% is not a hard and fast rule. I’ve come up with it as a rule of thumb to ‘compensate’ me for my additional efforts to secure a lower price than the absolute lowest fixed price one can find for this item. For me personally, a 10% ‘discount’ is enough of an incentive. For you, this might be higher or lower and that will obviously also depend on the actual price and thus the dollar value of this 10% discount. It’s your call but 10% is what I use in most cases. 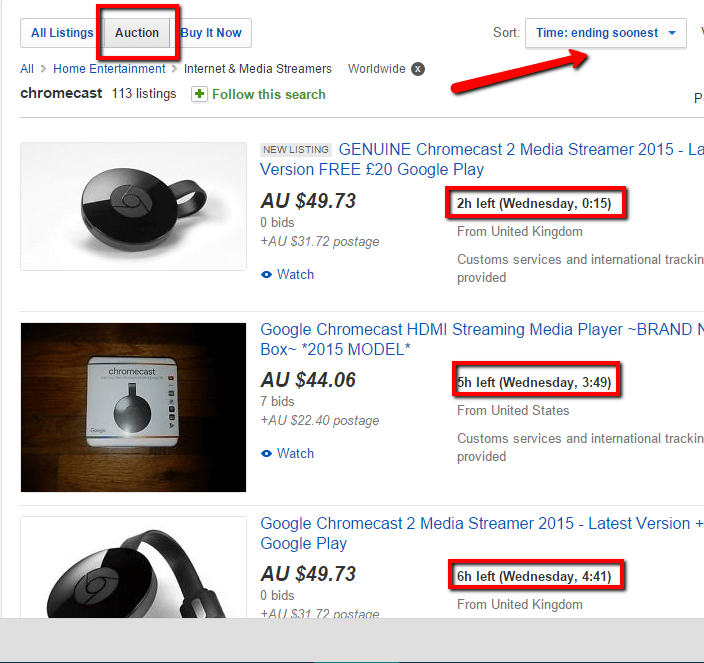 This site shows in real time all the auctions on eBay Australia which have less than an hour to run and have a current bid price of less than a dollar. As with fixed price listings, our trusty Auction Speller comes to the rescue once again. If you’d like to read more about how to exploit typos in eBay listings, I recommend this article. The final strategy I am going to cover is without a doubt an advanced one but can be very lucrative indeed. This is only for PROFESSIONALS! Nah, I’m kidding. You don’t have to be a ‘professional’. You just need to be keen to take your eBay bargain hunting skills to the next level. ‘eBay Sniping’ is the practice of entering a bid at the absolute last seconds of an auction (usually less than 5 seconds from the auction’s closing time). This can be done either manually or using automated tools. While there is a debate on whether this is ethical or not, it is definitely allowed under eBay’s current rules. 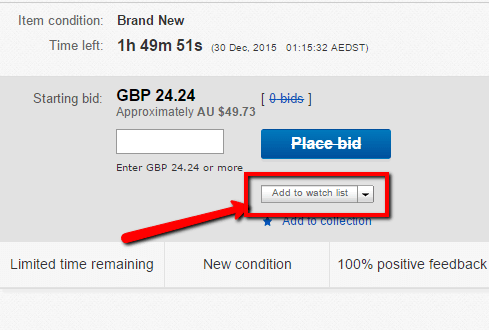 As I already mentioned, there are two ways to ‘snipe’ eBay auctions: manually or using automated tools. Automated tools may sound great and they definitely have their advantages (No stress, you can ‘snipe’ auctions that are scheduled to close when you’re going to be asleep). However, the main problem with these tools is the fact you have to give them your eBay account login details which poses obvious security risks as well as being technically against eBay’s terms of service. Not that eBay are that good themselves in keeping your account details secure but it’s their platform and therefore, their rules. Another drawback of these tools is that most of them cost money. If you want to play around with some free ones (keeping in mind my previous warning), you can try Goofbid (which is an online tool) and JBidWatcher (which is software you download to your computer). Alternatively, you can be a bit more ‘old fashioned’ and do your sniping manually. This is what I tend to do personally myself as I don’t really like the idea of giving my eBay login details to some mob I don’t know and who can then theoretically go on a shopping spree at my expense. As this (quite smug) guy proves in the video below, manual sniping can be as effective as any automated tool if you know what you’re doing. An important consideration whenever shopping online is the cost of shipping. This is no different when buying on eBay. When you buy anything on eBay, the item you bought obviously has to make its way to your door and we all know that this doesn’t come free (at least until those transporters from Star Trek become a reality 😉 ). Even when sellers advertise their listings as having free shipping, this is obviously not really free. They simply ‘load up’ the item price with the shipping cost. As you can see, the idea is that you collect your purchases from pre-designated collection points. Your purchase will not show up at your door and you’ll have to do a bit of travel in order to collect it but in return you also won’t have to pay any shipping charges. While the second option is for big retailers who also have their own physical presence and stores, the first option is aimed more at those retailers who are quite large but only operate online and don’t have their own physical stores (e.g Kogan). These online-only retailers can use selected BigW and Woolworths stores as collection points for customers who bought items from them through their eBay stores. None of these options caters for any of the smaller or casual eBay sellers who don’t have dedicated eBay Stores. Remember what I said about eBay trying to ‘squeeze out’ the little guy? Why you should only ever pay with PayPal and how to do it the right way? PayPal should always be your first choice for paying for any online purchase. This is especially the case in marketplace environments like eBay where you often don’t fully know the identity of the seller or that they are located overseas. You don’t share your financial details with any seller. Only PayPal knows them. If something goes wrong with the transaction, PayPal has various protection mechanisms to help ensure you either get what you paid for or get your money back. What this video neglects to mention however is that it’s a bad idea to give anyone (even Paypal!) direct access to your bank account through a direct debit agreement. If something goes wrong with a purchase and Paypal’s internal consumer protection procedures fail to provide a positive outcome or don’t provide cover at all (as is the case with purchases of real estate, motorised vehicles, industrial machinery, or anything you buy in person), it will be very hard for you to recover funds that have been withdrawn directly from your bank account using direct debit. If however, you use a debit or credit card instead, you always have the option of a ‘chargeback’ to fall back to. Therefore, never use your bank account as your payment source when buying with Paypal. Use a linked debit or credit card instead. As a matter of fact, unless you regularly receive payments through Paypal, I really can’t see any reason why you should link a bank account to your Paypal account at all! While it is definitely possible to score a ‘too good to be true’ deal when buying through auction, you have to be careful if you see something like that being offered through a fixed-price ‘buy it now’ listing. If the price of the item in a particular fixed-price listing is significantly lower than any other fixed-price listing of the same item, alarm bells should start ringing and you should look closely into the seller’s reputation and eBay sales history (available by checking their profile). You should also consider reporting the listing to eBay as being suspicious so they can investigate whether a seller’s eBay account has been hacked. The video below explains how to report suspicious listings and written guides can be found here. Just to give you an example of a suspicious listing, here is one I’ve personally come across while ‘lurking’ on eBay (one of my favourite pastime. Guess I really need to get out more… 😉 ). The asking price was $22 with free shipping for a brand new phone. The cheapest price at the time for a that particular model on staticIce was $225. The listing was under the category of ‘vehicles’ instead of phones. For the untrained eye, this might seem like a simple mistake by the seller and why they are selling the phone for such a low price (maybe no one could find their listing because it was in the wrong category). The thing that jumped to me straight away was that vehicles is one of the categories not eligible for Paypal buyer protection. At this stage it was quite obvious to me that these were scammers and that they were pros who knew exactly how the system works. I looked at the seller’s sales history and feedback from previous buyers was quite positive. However, this seller never sold any phones before. I reported the listing as fraudulent and the seller’s account as being potentially compromised and after a few days, I noticed that this seller’s profile was no longer visible on eBay. eBay almost never report back on the results of their individual investigations but it’s quite clear that there was something dodgy with that account and in all likelihood, someone has probably hacked the poor seller’s account. Be careful out there and maintain a healthy level of scepticism. Better be safe than sorry. That’s it. You’ve made it to the end! You’re no doubt well on your way now to become a fully fledged ‘eBay Ninja’. If being a buyer on eBay is not enough for you and you’d like to also dabble in being an eBay seller (and maybe even do that as a side business to generate some extra cash), this everyday Aussie mum explains how she regularly generates around $1000 per month from selling on eBay. Buying from ebay USA is not a great thing at the moment with the Dollar as it is. I have purchased a few guitars from the US when the Dollar was in our favour & picked up some insane deals but the same does not apply these days, especially when you add freight into the equation. I tend to agree in general Riff. I remember spending some time in the US back in 2011 when the Aussie dollar was worth 110 US Cents and was amazed how incredibly CHEAP everything was. While things have definitely changed since then due to changes in the exchange rate and also due to the ‘hidden inflation’ America has, there are still potential bargains to be had. As per my suggestion above, the best thing to do is to always run a ‘worldwide’ search for anything you may need and then sort it by ‘price+shipping’. This will guarantee you get the best deals, no matter where they are in the world and in which currency their are denominated.